Winter offers one of the best opportunities of the year to land a big lake trout. These monsters are one of the most active fish during the frigid months of winter, so they offer some amazing ice fishing action. Canada and the Great Lakes states offer exceptional lake trout fishing from January, right until ice out. Veteran lake trout anglers from these regions know there are some basic steps to follow to be successful in landing a lake trout of 15 pounds or more. Lake trout are always moving and can be located just about anywhere in a lake, during the winter. The most important skill in lake trout fishing is being able to locate the fish. Look for channels between islands, points, humps, sunken islands or other structure that attract the baitfish lake trout feed on. 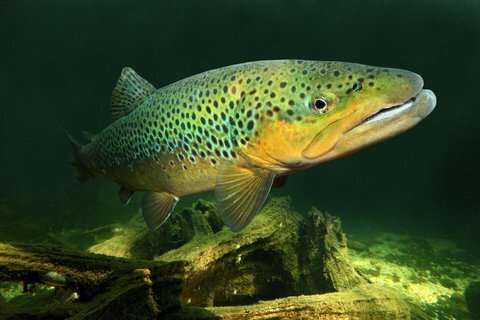 Lake trout will keep moving to find these food sources. If you find the baitfish, you are likely to find lake trout. Stay mobile, so you are able to move quickly to try new locations. While lake trout can be found nearly anywhere in a lake, they will usually stick close to the bottom. Whether you are fishing in 40 feet of water or in water 10 feet deep, concentrate your efforts at the bottom of the lake. Occasionally lake trout will be suspended while they are feeding on baitfish, so be prepared to move off the bottom in such instances. Most experienced ice anglers are familiar with how to jig for fish, but lake trout take an extra effort when it comes to jigging. The key to attracting lake trout is very active jigging. Keep jigging hard and fast to get the attention of the fish. Throw in an occasional pause, but even when you pause, use flicks or jiggles to keep the bait in motion. During these pauses are when the fish is likely to hit your bait. Vary your jigging between long, deep jigs and shorter movements. Do not be afraid to bounce your jig right off the bottom. Some of the more popular lake trout baits include tube baits, Swedish pimples and airplane jigs, but you should also carry some swimming baits like the Jigging Rapala. Try tipping your baits with a minnow head. Jigging minnows like a cisco also works well. One of the best tips for baits is to try to match the size of your bait with the size of the baitfish the lake trout are feeding on. Popular colors include white, pear or silver. Lake trout can be caught day or night, but the most productive hours tend to be the early morning and late day. Concentrate your efforts on the hours around sunrise and sunset and you are likely to catch more fish. Big lake trout can easily be lost if you are fishing a hole that is too small. Preferably, fish a hole that is at least 9 inches. Another great tactic is to drill a double hole to make sure you have enough space to pull the fish through the ice. Lake trout can offer some of the most exciting ice fishing opportunities available. Implementing these tips in your lake trout outings will dramatically improve your odds for success.